Solar photovoltaic (PV) systems represent a reliable, renewable, and clean alternative for energy generation. Throughout the globe, an unprecedented transition to solar energy is underway. In the U.S., top businesses such as Wal-Mart, Costco, Kohl's, Ikea, Macy's, and Staples have recently "gone solar", proving the cost-effectiveness of PV systems. A wide range of financing opportunities are available for those investing in the solar market. Companies engaging in R&D efforts aimed at developing new or improved solar products and processes may be entitled to federal research and development tax credits. The federal government supports investments in solar energy through different mechanisms, as briefly described below. Solar Investment Tax Credits (ITC) - Under Code Sec. 48, companies installing solar PV systems are eligible for a 30 percent tax credit, considering the total investment amount. This opportunity is due to expire as of December 31, 2016. Depreciation of Solar Energy Property in MACRS - Qualifying solar energy equipment is eligible for five year Modified Accelerated Cost Recovery System (MACRS) tax depreciation. This mechanism accelerates the cost recovery period for such investments. Section 1703 Loan Program - Under Section 1703 of Title XVII of the Energy Policy Act of 2005, the U.S. Department of Energy offers financial support for innovative clean energy technologies that face difficulties in obtaining private financing due to high risks. The eligibility criteria call for the reduction of air pollutants or anthropogenic emissions of greenhouse gases and the employment of a new or significantly improved technology that is not yet commercial. The list of technologies to be considered includes solar energy. Loans have already reached $33.8 billion and an estimated 655,000 jobs were created. Department of Energy Funding Opportunities - The DOE regularly offers grants aimed at supporting innovative approaches to solar energy. On September 30th, the DOE announced a proposed $100 million in FY2014 funding for Energy Frontier Research Centers (EFRCs). Universities, national laboratories, nonprofit organizations, and for-profit firms are encouraged to apply. The competition will be open to both existing EFRCs and to institutions willing to establish new ones. Solar PV is among the technologies supported by the program. The centers' objective is to "harness the most basic and advanced discovery research in a concerted effort to establish the scientific foundation for a fundamentally new U.S. energy economy." All the previously discussed mechanisms guarantee a significant level of market certainty in the solar industry. This favorable environment is a driver for growing long-term investments and cost-cutting innovation. A recent analysis from Bloomberg New Energy Finance anticipates a worldwide addition of 36.7 GW in new solar PV capacity in 2013. This would be an all-time high even when compared to last year's 30.5 GW. For the first time in history, solar growth will outpace wind's. Current PV capacity could fulfill the household electricity needs of nearly 70 million people. 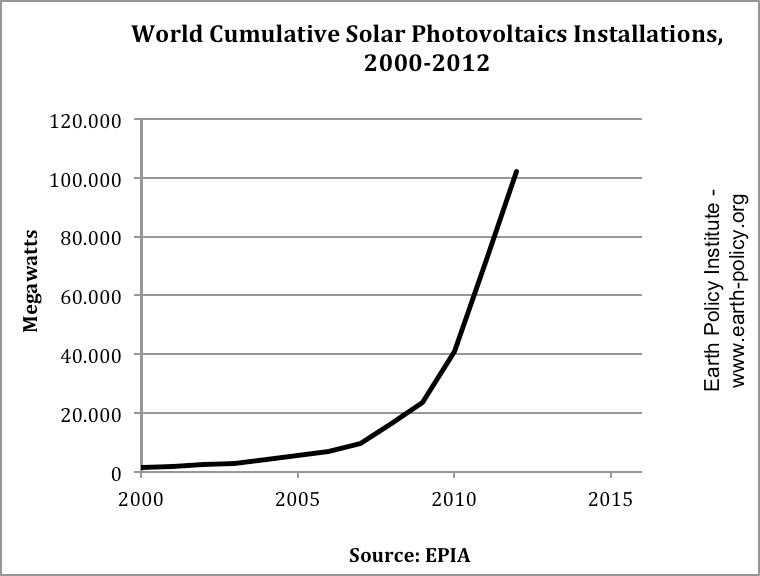 The following chart demonstrates the huge surge in the world's cumulated solar PV installations from 2000 to 2012. The number of countries installing PV systems is also increasing. While in 2006 only a handful of countries had solar capacities of more than 100 megawatts, there are now 30 nations in this position. The International Energy Agency expects this number to double by 2018. Different business drivers explain this widespread growth in solar PV use. Since 2006, China has doubled its installed capacity every year. The country has recently set a national goal of 35 GW by 2015, a 67 percent increase compared to mid-2013. This measure will contribute to the government's efforts to address the country's environmental problems, particularly hazardous levels of air pollution. According to the World Bank, China has 16 of the 20 most polluted cities in the world. The newly established Chinese goal can also be understood as an incentive to the national solar industry, responsible for manufacturing half of the world's solar panels and currently faced with a supply glut. Germany has the largest capacity of installed PV worldwide and has repeatedly broken its own records for monthly solar output. By the end of 2012, the country had around 400 MW solar power capacity per million people, almost double the capacity of number two, Italy. The goals of being nuclear-free by 2022 and generating 80 percent of power from renewable sources by 2050 are behind Germany's rapid embrace of solar energy. Similarly, Japan has turned to solar energy as a response to the disaster at the Fukushima nuclear plant in 2011. The country has recently become fifth in the world to achieve 10 GW of cumulative solar capacity. The diversification of the country's energy portfolio is not only a response to a nuclear crisis but also a matter of energy security. Heavily dependent on foreign imports of hydrocarbons, Japan has been vulnerable to Middle East tensions. Latin America is yet another promising region for solar energy. According to the market research company NPD Solarbuzz, Latin American countries are poised to be part of the next solar PV boom. This is due to abundant solar resources, growing middle classes, and high electricity prices. The Inter-American Development Bank advocates that, with an expected annual economic growth of 3 percent, Latin America will need to double its installed power capacity by 2030. In this scenario, governments from the region have adopted a series of incentives to renewable sources of energy. Most countries have set ambitious renewable energy targets: 27 GW by 2020 in Brazil, 20 percent of installed capacity by 2020 in Chile, and 25 percent by 2014 in Mexico. According to the Solar Energy Industries Association (SEIA), the second quarter of 2013 was solar's second best quarter ever in the U.S., with 832 MW in new installations. This represents a 15 percent increase over the previous quarter. There is currently 9.4 GW of solar energy in the U.S., enough to power 1.5 million average American homes. This amount of clean energy generation displaces more than 9 million metric tons of CO2 emissions per year. SEIA expects installations to maintain an upward trend. The organization claims there is a new solar project installed in the country every four minutes. In addition to the favorable financing environment previously presented, other policies have contributed to the solar boom. Renewable Portfolio Standards (RPS) or Renewable Portfolio Goals (RPG) have been implemented in 36 U.S. states and the District of Columbia. They consist of regulatory mandates that require an increased production of energy from renewable sources. Obligations are directed to electricity supply companies, which must derive a specified fraction of their electricity from eligible sources. Purchasing electricity from a renewable facility inclusive of all renewable attributes. Electric power generation accounts for about 40 percent of U.S. carbon dioxide emissions. The EPA has been working on new federal emission standards to limit CO2 emissions from electric generating units, particularly coal and natural gas fired plants. The agency recently released a proposed "Carbon Pollution Standard for New Power Plants", aimed at establishing a new Source Performance Standard under the Clean Air Act. In addition, it has been developing a regulation to limit emissions from existing plants. Experts anticipate that the future regulation can contribute to a cap-and-trade system, which would foster the use of renewable energy sources, including solar. Numerous U.S. universities have worked on solar PV innovation. As presented in the following paragraphs, recent breakthroughs point towards a sunny future. Researchers from the State University of North Carolina have found a way to improve stacked solar cell connections. This innovative achievement can contribute to higher efficiency in solar systems and reduce the cost of solar energy generation. Stacked solar cells, one of the most efficient cells currently available, are able to convert up to 45 percent of the solar energy input into electricity. However, connecting junctions in existing stacked cells lose voltage when exposed to intensified solar energy, wasting energy as heat and, therefore, undermining efficiency. The new technique eliminates voltage loss, even when exposed to 70,000 suns of solar energy. This advancement can revolutionize the solar market, as it will enable the use of concentrating lenses with unprecedented conversion rates. Texas A&M University has announced the construction of the world's largest solar institute, created to evaluate, develop, and test renewable energy technologies, particular solar PV ones. The research center will cost $600 million and host a 50MW solar field. Considered a market-changing partnership, the collaboration between Texas A&M University and PPA Partners is expected to accelerate the advancement of solar energy and create thousands of renewable energy jobs. Established by the Department of Energy, the University Center of Excellence for Photovoltaics (UCEP) at Georgia Tech is focused on developing cost-effective PV. To this end, the Center has engaged in innovative efforts to improve the design, performance, and reliability of PV systems, and to deepen the scientific understanding of advanced PV devices. Research developed at UCEP is ultimately targeted at giving the country a competitive edge in the solar market. Recent advances include the production of record-breaking high-efficiency cells made of low-cost materials. Arizona State University is also at the forefront of solar PV research. In collaboration with seven other academic institutions and 40 industry partners, the university is leading an effort to develop technologies and manufacturing practices that will make solar PV a major source of energy to U.S. homes and businesses. The project is funded by an $18.5 million grant from the National Science Foundation and the Department of Energy. One initial objective is to develop a highly efficient hybrid solar cell. It consists of making traditional silicon solar cells thinner and applying a tandem, thin-film organic solar cell on top. If successful, this new cell can contribute to a 10 percent surge in energy capturing capacity. Solar PV research and development initiatives are not restricted to the academic world. On the contrary, university efforts have set the basis for growing corporate innovation. Solar PV companies investing in new and improved products and installation processes are strong candidates to receive federal R&D tax credits. The following paragraphs present notable examples of innovative technologies that can revolutionize the solar market. Solar Thin-Film Technology can eventually substitute conventional solar panels. Printed in rolls, the innovative films are cheaper to produce and easier to install. Moreover, this groundbreaking technology opens new opportunities for solar system placement, such as integrating them into roofing materials. RSI, Silicon Valley developer of thin-film, recently announced a world record for cadmium telluride PV module size. The company produced a 1.5 square meter module. Through the innovative process of Rapid Efficient Electroplating on Large-areas (REEL), the company claims it can speed the plating step and remove limitations on panel area. This could lead to a manufacturing cost of less than 40 cents per watt by 2014. Solar Windows convert sunshine into energy while remaining see-through. New Energy Technologies, from Columbia, MD, is developing an innovative solar window technology that consists in "spraying" glass surfaces with electricity-generating coating. The company has nine product development goals for this technology, including commercial, residential, and architectural glasses, as well as flexible films. Solar Balloons are inflatable, plastic, thin-film balloon-like solar concentrators with the ability to concentrate sunlight into photovoltaic cells located at an inside focal point. This innovative technology can be used to provide electricity to remote areas lacking the land and infrastructure necessary for traditional power systems. This can be particularly positive, since many of the earth's sunniest territories are located in the ocean or deserts. Moreover, the balloons' circular shape ensures they constantly receive direct sunlight. Since 2008, California startup CoolEarth has engaged in solar balloon R&D. The company uses an original technology that manipulates air pressure inside the balloon to change the shape of its mirrored surface in order to achieve maximum concentration of sunlight onto the solar cells. Not only does this technique eliminate expensive optics normally used to concentrate sunlight, but it also boosts electricity generation by 300 to 400 times. Nanowire-based Solar Panels, also know as "hairy solar panels", feature semiconducting nanowires of cylindrical structure with diameters of about a 10,000th of a human hair. This innovative technology can combine three very desirable characteristics : 1) flexibility, 2) transparency, and 3) energy efficiency. The unique physical light absorption properties of nanowires anticipate the emergence of a new generation of highly efficient solar cells. Swedish startup Sol Voltaics is at the forefront of nanowire research. The company is working in partnership with Lund University to produce ink filled with nanowires. The objective is to sell this ink to existing manufacturers of solar panels as a means to boost efficiency. Experts estimate the ink would add one or two cents per watt to production costs, an amount easily compensated by efficiency gains. Micro-inverters can reduce installation costs of PV systems and increase efficiency through the conversion of DC power, produced by solar panels, into AC power that can be used by homes and businesses. Advantages include the use of one micro-inverter per panel thus eliminating limitations in overall wattage and facilitating expansions. Moreover, shades or damages in one solar panel do not affect others, guaranteeing individual optimization. Maximum Power Point Tracking (MPPT), longer warranties, improved safety, and silence are examples of additional advantages. California manufacturer of micro-inverters Enphase Energy has more than 30 patents for its innovative systems. The company has created exclusive methods and apparatuses aimed at simplifying the installation and improving the performance of micro-inverters. Infrared Spectrum Solar Panels are theoretically able to capture not only the visible spectrum, as current solar panels do, but also some of the infrared spectrum. About 40 percent of the solar energy reaching the Earth's surface is located in the near-infrared region of the spectrum. With conventional solar panels, all of that energy is wasted. MIT researchers have developed a new kind of all-carbon solar cell that can harvest this unused energy. However, significant R&D efforts will be necessary before infrared spectrum solar panels become commercially available. Innovation in the solar industry is leading to lower module prices, fewer maintenance requirements, and easier installation processes. This favorable scenario, combined with high energy prices and innovative financing options, have paved the way for achieving grid parity. Grid parity is the point where the cost of solar power is less than or equal to the price of purchasing power from the grid. Once electricity generated from solar panels become cost-competitive with retail electricity, people will automatically migrate to this economical alternative and government subsidies will no longer be necessary. Predictions for reaching grid parity in the U.S. vary considerably. The Deutsche Bank recently published a study according to which 10 states already experience solar PV grid parity without additional subsidies, considering module prices of $3/watt. By 2016, this number would be 36 states if the investment tax credit were reduced to 10 percent, or 47 states in case it remained at 30 percent. The Deutsche Bank believes that solar PV installations will rise seven-fold in the upcoming years, increasing the country's capacity to around 50GW by 2016 and making the U.S the biggest solar market on the globe. This solar boom however is not expected to go through unopposed. The surge in the uptake of distributed solar PV threatens the conventional energy sector, particularly the utilities. For this reason, a "backlash" against net-metering may be on the horizon. This energy policy allows consumers who own renewable energy systems to deduct any energy outflows from metered energy inflows. In other words, utilities are required to buy power generated by such systems. While solar energy has helped offset peak demand, its dissemination may undermine utilities' profitability. Thus, the viability of the net-metering arrangement has been questioned. The beginning of a solar era would require increasing current net-metering ceilings which would involve new legislation and intense negotiations. From China to Latin America, solar PV is gaining strength throughout the world. The U.S. solar industry must take advantage of favorable tax and financing opportunities to invest in the development and commercialization of innovative technologies that will be at the heart of the upcoming solar revolution. Federal tax credits are available to assist companies developing improved solar photovoltaic products and for end users purchasing those products.